“Nun, Gimmel, Hey and Shin, watch my Dreidel spin, spin, spin. Until it gets me thinking about how our lives as mothers have a lot in common with a spinning Dreidel. A Dreidel spins around on the table and then stops and falls down. Sometimes it goes fast and other times it’s slow. Sometimes we spin so super fast, it’s hard to realize and recognize what is really going on because our minds are so occupied with the next thing on our To-Do list. We keep spinning while relationships can get neglected and important things get left by the wayside. We can easily lose our values, goals and purpose. We can lose what is truly important in life. Some days, hours and minutes we get a “Gimmel”– we are in a place to give 100% to what is happening around us. Lots and lots of energy, passion and attention to detail. Sometimes it’s a “Hey”– we can give something- maybe do a half job or a half effort. Sometimes we only have enough energy and patience for that. And sometimes it’s a “Nun”– nothing. When life gets too frantic and too busy with too much going on we can turn numb. It can be hard to think clearly and take action when things are a blur. And then, at times, we land on “Shin”- where we have to put back some of our goodies back to the middle pile. We pull back and say “no” to requests and extra commitments that we can’t currently manage. We take stock of our lives and current situations and put those things in the middle of the pile. 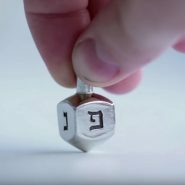 The handle of the Dreidel is what helps it start and keep on spinning. Just like the handle is on the top of the Dreidel, so too we know that Hashem is on top of our lives. He is the one that allows us to keep spinning and makes the events in our lives come together in the most special way. So this Chanukah, as you stop to sit and gaze at the candles, give thanks to Hashem for giving us the precious gift of life. We should Daven for an abundance of energy and Koach to keep spinning! Rina Jacobs is a mother of 3 young children and an early childhood educator in Melbourne, Australia. In her spare time she enjoys exploring life themes through writing and sharing it to inspire others. Amazing analogy Rina! Love how you can put a positive ‘spin’ (pun intended) on the craziness of life. Beautiful Rina! And so well written 🙂 missing you and your family! Lovely Rina!! You portray the “full half of the cup” so aptly!! Amazing insight!